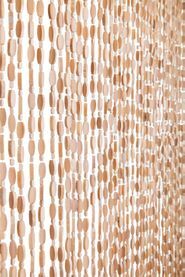 Catch waves of color with this energetic, Wooden Bead Curtain "Primary Wave" to use in place of traditional doors and room dividers or to refresh tired old window curtains. 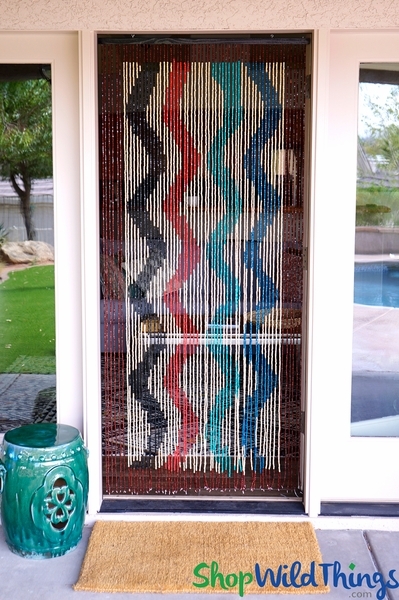 Easy to hang and easy to walk through, this 60 strand curtain is 35" wide by 6.5" long and is loaded with beads sporting large waves of colors: dark cyan blue, snazzy turquoise, bright cherry red and classy black, surrounded by cream beads with a dark brown border. The small beads are 3/8" wide by 1/4" long and the wood header rail is black with 2 metal eyelets attached for quick hanging right out of the box. This curtain weighs 4 lbs. This decorative backdrop is a fun and unique alternative for traditional door and window treatments and the small beads make it easy to walk through without tangling the strands (no wipe-outs!). Even with the strands tied off to the sides, the pops of color make an awesome frame for a doorway. This exceptionally constructed beaded panel will totally transform the look and feel of an entire room and the awesome colors will instantly make you smile! The curvy splashes of color are great for entrances at restaurants and clubs, as backdrops, window coverings, wall accent Decor, coverings for closets, pantries, storage areas and laundry rooms. The beads are natural wood, meaning there may be slight variances in bead size so the bottom may be a bit uneven. 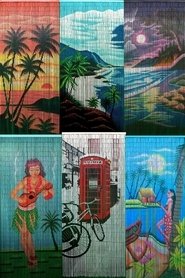 For a larger doorway or wall, hang 2 or more side by side. Please see the video below to see why we love wood curtains and how they can transform any door or room. If you've got questions, consult our expert in-house staff. We've been selling the highest-quality beaded curtains available to movie production companies, theater stage designers, top party planners and individual customers since 1989. Along the way, we have become the world's leading and most trusted online seller of curtains, canopies, chandeliers, backdrops and event lighting. Best value for the amount of money it cost buy and ship. I was extremely pleased with the quality and ease of installation with only two hooks required to suspend it or I wanted. I would recommend to anyone.